Above photos from our Africa Travel Association 21st International Congress Guide, Windhoek, Namibia, May 1996. Images supplied by Naimibia Tourist Office. 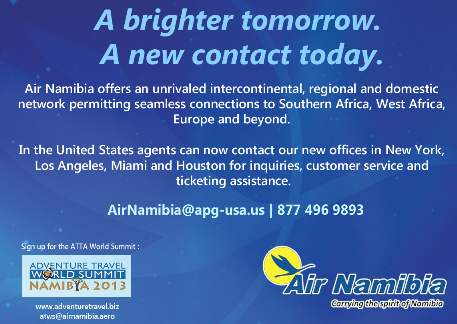 Air Namibia is the national airline of Namibia, headquartered in the Trans Namib Building inWindhoek. Its international hub is Windhoek Hosea Kutako International Airport with a domestic services hub at the smaller Windhoek Eros Airport. In addition to domestic services, the carrier also operates regional and international passenger and freight services to destinations in Africa and Europe. 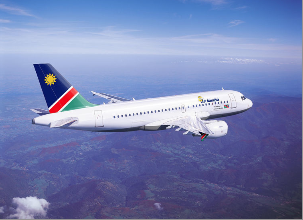 Air Namibia is wholly-owned by the Namibian government. By Capa Aviation. The World Wildlife Fund will start testing a new drone surveillance program in Namibia next month that aims to coordinate data from the air and ground to give park rangers an edge over poachers, according to Crawford Allan, Director of the Fund�s TRAFFIC North America project. �It will be a great advantage to protect both wildlife and the rangers,� Allan said. �We will know where the animals are; the (drone) relays the location to ground control, and you can mobilize rangers on the ground to get in between the animals and form a shield. We see this as an umbrella of technology." Crawford said it's the first time that such technology has been used in the field. It�s a three-year project at two sites in Africa (the second is being negotiated) and another two in Asia. The project is funded by a US$5 million grant from Google Global Impact Awards. Eventually the goal is to use cellphone (GSM) technology to connect to the drone flights. A group called Conservation Drones has also been working with independent researchers at 15 to 20 sites around the globe to help them track wildlife better and develop information that could help them stop poaching. They have worked to monitor rhinos in a national park in Nepal and count orangutan nests in the dense jungles of Sumatra, Indonesia. Conservation Drones are inexpensive, autonomous, and operator-friendly unmanned aerial vehicles for surveying and mapping forests and biodiversity. Non-technical operators can program each mission by defining waypoints along a flight path using an open-source software. The Conservation Drones are able to fly pre-programmed missions autonomously for a total flight time of up to 50 minutes and over a distance of 25 km. Depending on the camera system installed, these drones can record videos at up to 1080 pixel resolution, and acquire aerial photographs of <10 cm pixel resolution. Aerial photographs can be stitched together to produce near real-time geo-referenced land use/cover maps of surveyed areas. It is believed that Conservation Drones have great potential for environmental and conservation applications, which include near real-time mapping of local land cover, monitoring of illegal forest activities, and surveying of large animal species.